Note: this article is not telling you where to hide jewelry from professional thieves. This article is for people wanting to hide jewelry from, say, little sisters who tend to “borrow” it permanently (and/or break it), or playing kids who sometimes get into stuff they shouldn’t, or even possibly unskilled burglars who break in to steal stuff they can easily sell. Here are some secret places to hide jewelry from people like that. If you’ve decided that whatever you’re hiding isn’t worth renting a safety deposit box or buying a safe (or you can’t afford either and are looking for the next best thing), these tips are ways to keep small items out of sight where most people would never think to look for them. There are a couple of good places to do this. One place to hide jewelry is amongst your clothes. Necklaces, bracelets and anklets can be draped over hangers under shirts. You can put earrings and pendants in small bags, and clip or tie the bags to hangers. 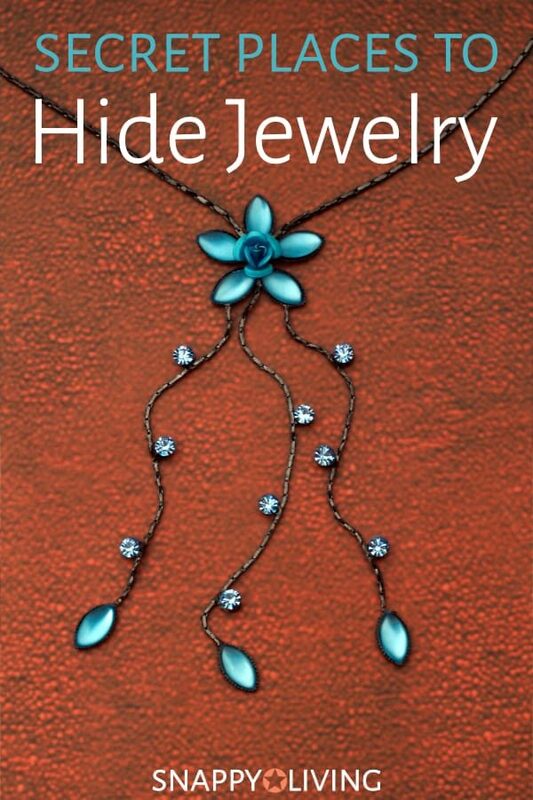 Make sure the jewelry is hidden from sight if someone rifles through your clothing. Put it on the back of the hanger, toward the wall of your closet. Don’t store items in clothing pockets – they tend to jut out and look obvious. A dirty clothes hamper is one step up from a trash can: no one expects to find valuables there, and no one wants to rifle through what’s in it to find them. Of course you don’t just want to toss a fine chain necklace into a bin with buttons, zippers and other things for it to get caught on. Create a false bottom. The best way to do this depends on what type of hamper you have. If it’s a plastic hamper, you might be able to find a small, flat box that matches it. Glue some old socks or undies to the lid and set it down in the bottom. Anyone looking in will think there’s nothing but dirty underwear in the hamper. If you have a wooden hamper, a wooden or fabric box could do the same trick. Under the lid. You can attach a sheet of opaque plastic or fabric under the lid of some hampers so it makes a sort of pocket. Stash your stuff in that and make sure it’s not noticeable when you open the hamper. Under a ridge. Some hampers have a ridge at the top of the container. You can tape jewelry under that. If you’ve got a drawer or box of hanging files, you can hide small items at the bottom, wrapped in something to make them blend with the bottom of the drawer or box. For example, with a translucent white file box, just cut strips out of a white plastic grocery bag, wrap pieces of jewelry in the strips, and put the strips at the bottom of the box, underneath the hanging files. With a wooden drawer, a paper bag from a shop will probably work. Make sure your files are crammed pretty full, even if you have to stuff junk in them . If there’s a lot of room for them to swing back and forth on their rack, the items at the bottom might become noticeable to someone going through them. If you’ve got a piece of furniture that’s not hard to reach behind, you can stick pushpins into the back and drape jewelry items over the pushpins. This tip relies on how unlikely it is that anyone would look at the back of your desk or bookshelf or dresser, so consider your hiding place carefully. If there’s an outlet or something behind that piece of furniture that someone’s likely to be hunting for, they’re going to come across your stash. Electronics. Never hide anything inside an electronic, because those are the first type of items thieves take – even unprofessional local kids burgling the neighborhood. So a thief might steal the electronic and then discover a bonus item tucked inside it. Electronics are also attractive to kids and untrustworthy relatives. Store-bought hollow book. Everyone’s seen the fake hollow books at outlet stores, and they’re not that hard to recognize. If you’re going to use a hollow book, make your own so it will really and truly pass for a real book – and probably not one your potential meddler has ever seen before. Be sure to choose a book the sort of people you’re hiding it from aren’t likely to pick up and read.